“Lovell, Coryell & Co. was a British publishing company, based in New York, founded in 1892 by John Wurtele Lovell and Vincent M. Coryell. A subsidiary of United States Book Company. Having moved in may 1893 to the offices of the United States Book Company at 5-7 East Sixteenth Street, Lovell, Coryell, and Company were forced to move again in February 1894 upon the bankruptcy of the parent company. In 1897 Lovell, Coryell and Company were renamed Coryell and Company and taken over by the American Publisher’s Corp..” (source). 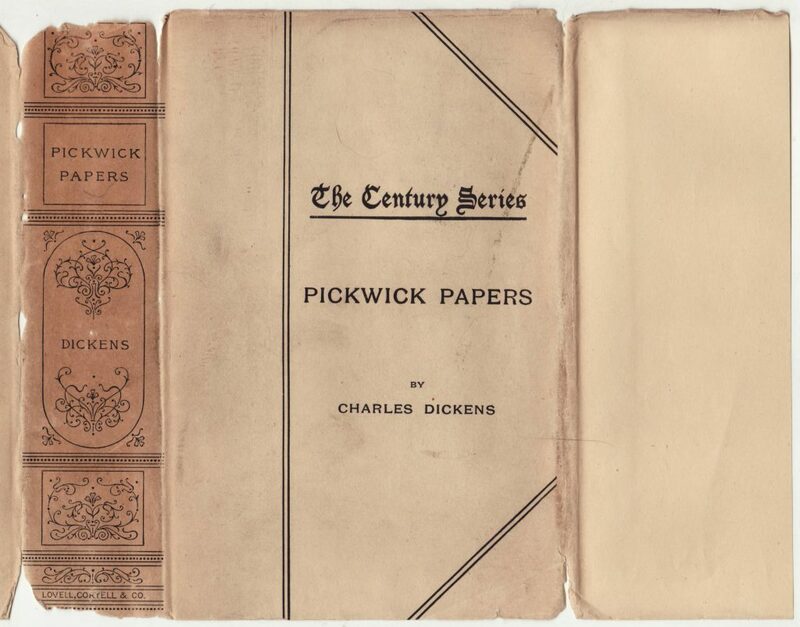 1897-1898: series issued by the American Publisher’s Corp.. (source). 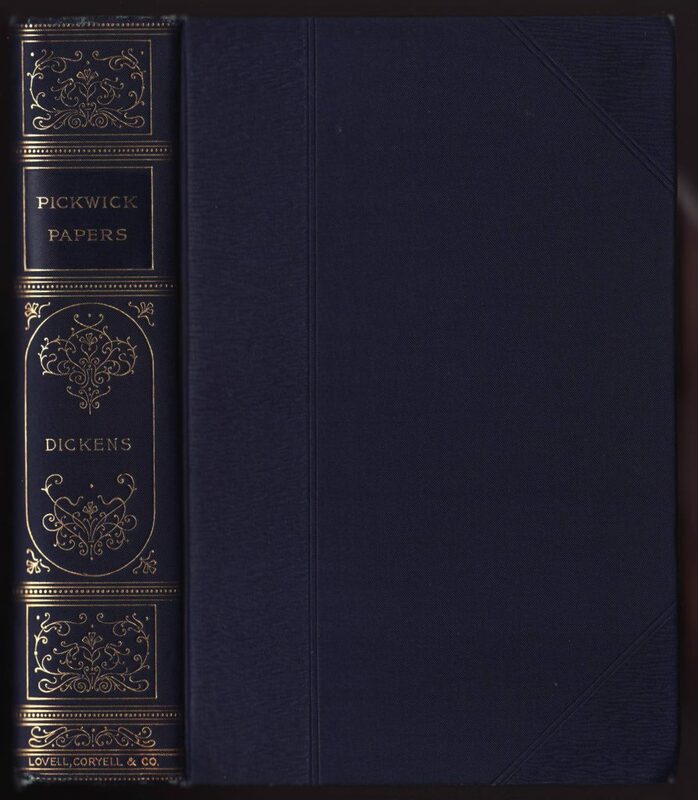 The jacket below covers an undated copy of Dickens’ Pickwick Papers. However, the address for the publisher dates the book to 1897, the last year for the publisher Lovell, Coryell & Co. (as it was absorbed fully into the American Publishers Corporation, which soon after went bankrupt). Jackets are common to the series with a fussy design on the spine which mimics the fussy design on the book’s binding (see below). The jacket cover includes the series name, title, and author along with a few lines that mimic patterns on the front of the book itself. The back of the jacket lists the 100 titles in the series. 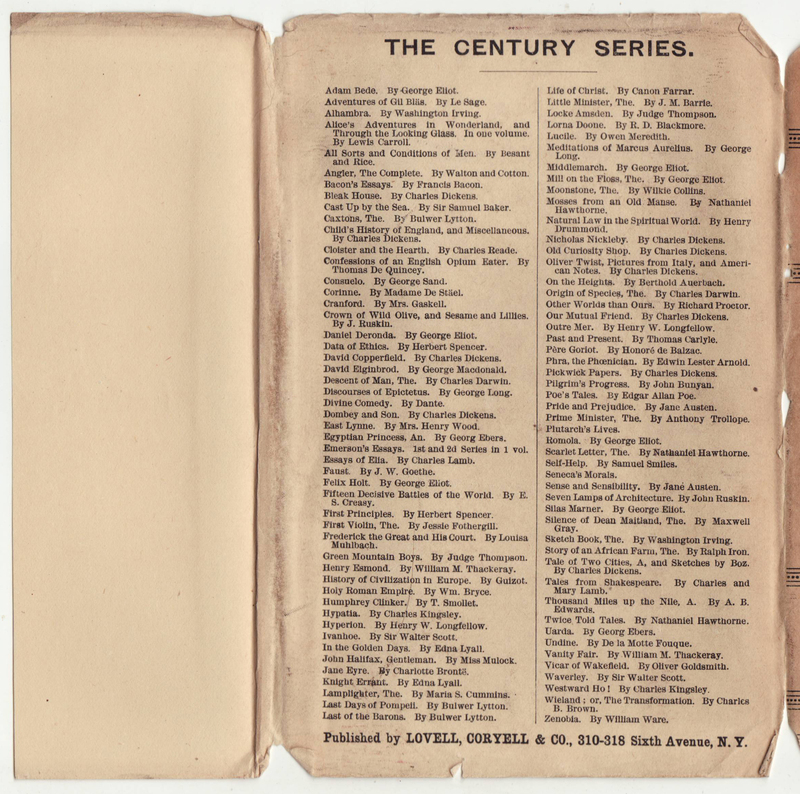 The series was announced with 100 titles (in 1891/1892) and did not seem to expand beyond that number of titles. 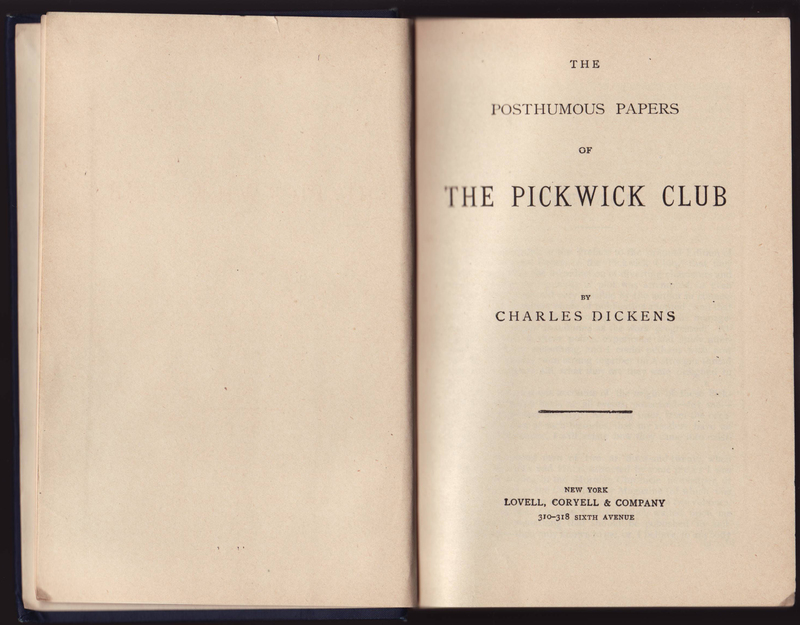 The publisher’s address (310-318 Sixth Avenue, New York) dates the book to 1897.
the blue cloth binding includes gold decorations mimicked by designs on the jacket. Wavy patterns and lines (also on the jacket) are debossed on the front of the book. The series name is not indicated on the book itself. There is no half-title page on this copy of the book. The publisher is indicated, but no date. 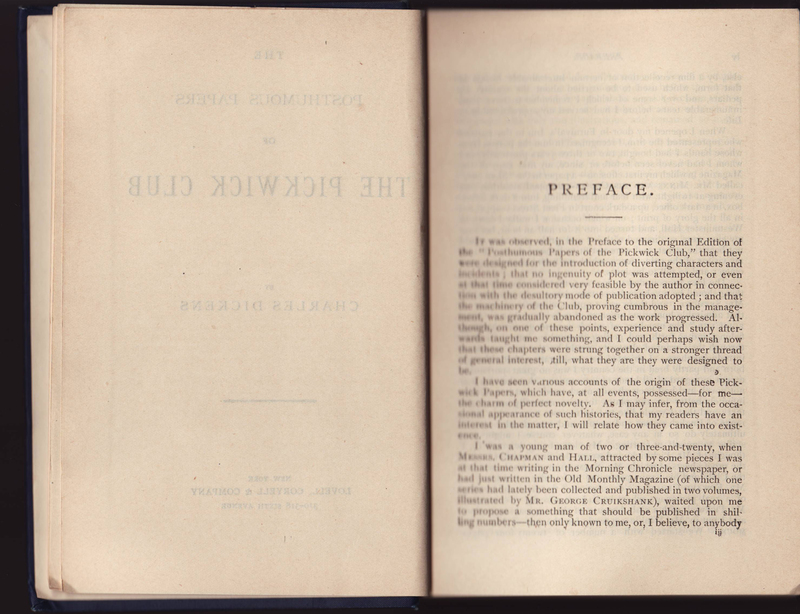 The series name is not included on the title page (nor anywhere in the book itself). Thus the jacket is the only place the series name is evident.